Photo Booths are great additions to wedding receptions for so many reasons, here are a few to think about…. 1. Entertainment Value: Photo Booths will keep guests entertained throughout the whole night as they pose for fun and goofy photos! Your guests will have an absolute blast. As props are provided with every photo booth rental, your guests will be able to make the photos extra silly! And let’s be honest, we know that there is drinking at most weddings…. As the night goes on, the photos get even better and better. 2. Favors/Keepsakes: With every photo booth rental, photos print instantly on site, providing every guest with photo strips to take home. The photo strips act as little favors that guests can keep to remember the special day they were able to share with the bride & groom. One of the cool features with photo booths is that the strips can be customized with the bride and grooms name, date, and or monogram! 3. Relive the night! With every photo booth rental, an online gallery is made special for that event with all of the photos to view and share. This allows all of your guests to view and share the pictures with their family and friends! Upload the pictures to social media sites, email pictures to family members or save them on your computer to treasure forever! The online gallery feature allows you look back and remember how much of a memorable night it was! 4. Special For The Bride & Groom: A photo booth can be a very special part of a wedding reception for a bride and groom as they also will be able to look back on all of the photos and see how much of a wonderful time everyone had! The bride and groom will given a custom flash drive with all of the photos on it from the whole night! Another cool feature that the bride and groom can cherish is a custom photo book! 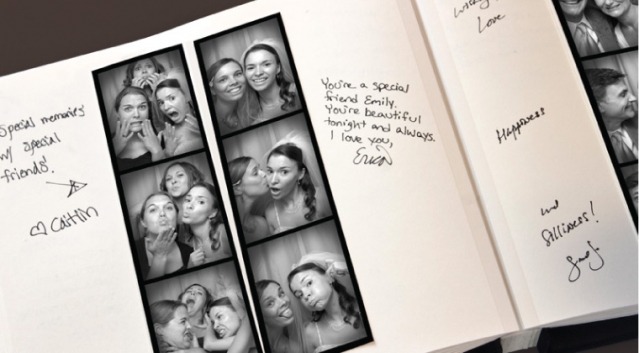 A popular add-on in which a copy of every photo strip is taken in placed in a photo book, where guests can then leave a special note right next to their photo strip. This will provide the couple with a fun yet sentimental keepsake they can look back on years down the road! 5. Cost Effective: Compared to many other wedding costs, the price to rent a photo booth for a night really is not that bad. Here at Raleigh Dream Events, photo booth rentals start at only $400 all-inclusive. For the amount of value you get with a photo booth, the price is well worth it! At Raleigh Dream Events we specialize in Photo Booth rentals and we want you to enjoy a photo booth as much as all of our past customers have enjoyed one! We hope you enjoyed this article!